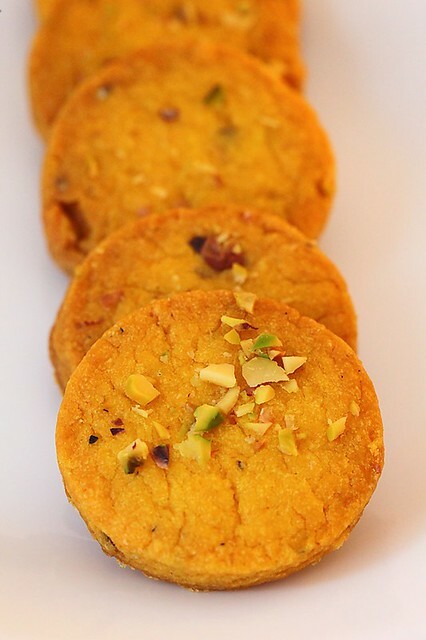 The distinctly perfumed and intensely coloured slender strands of saffron infused some magic into my rava laddus, kheer and then proceeded to do the same to these cookies which were also a part of my Janmashtami offerings to Lord Krishna this year. 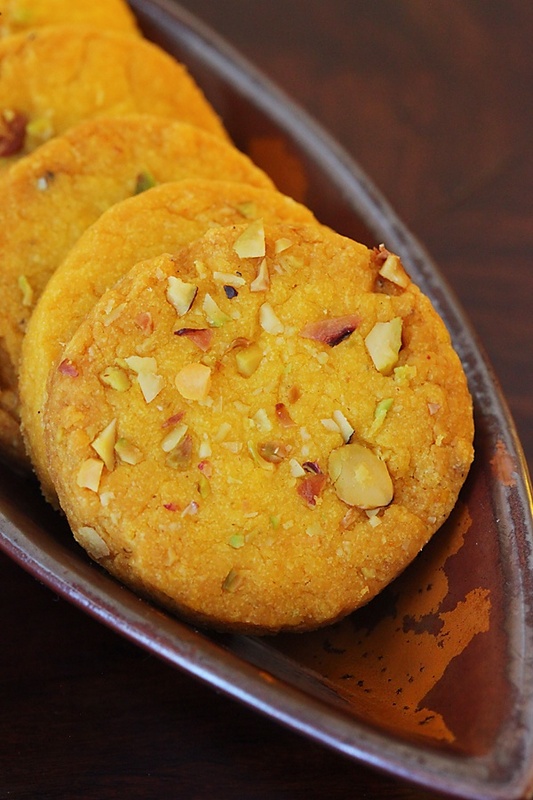 With hints of cardamom and nutmeg, the delightful and subtle fragrance of saffron really comes through in these cookies. 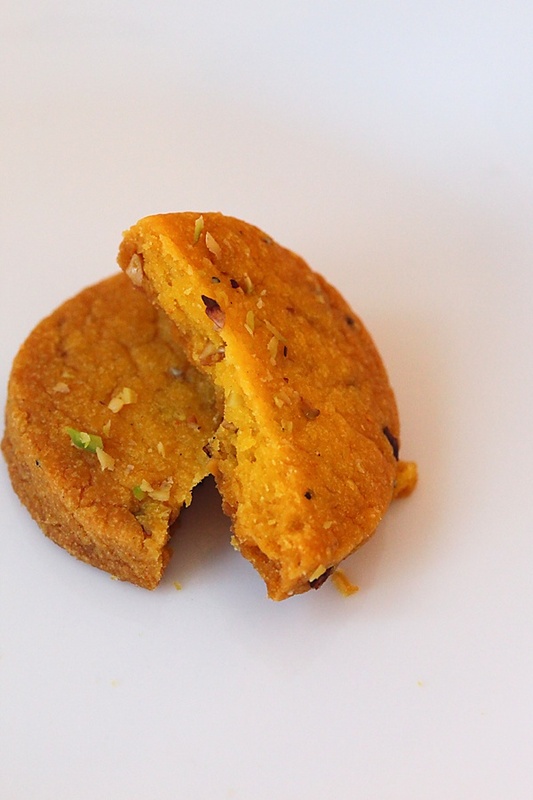 The use of ghee instead of butter and these spices put together make these cookies or biscuits essentially Indian in nature. The pistachios not only add crunch and colour but also make these look so beautiful! The mezzaluna is a wonderful tool to have to crush the pistachios. Its also great to chop herbs! Speaking of the mezzaluna, I must tell you a short story. When Rohit was in Switzerland, some 4 or 5 years ago, I asked him to get me a mezzaluna and showed him some pictures of how it looked like!. He approached a store assistant in Zurich who could speak and understand a little English and asked her for a “mezzaluna”. She promptly nodded her head, disappeared for a few minutes and came back with the largest chef’s knife he had ever seen! After everything from a rolling pin to a skewer made their appearance in front of my husband and after a lot of nerve racking explaining (no wonder he’s so good at dumb charades!) and just as he was about to give up, my mezzaluna made its appearance! God bless that store assistant! From then on, I have in my arsenal 3 to 4 mezzalunas but the one from Zurich, Switzerland remains my favourite! 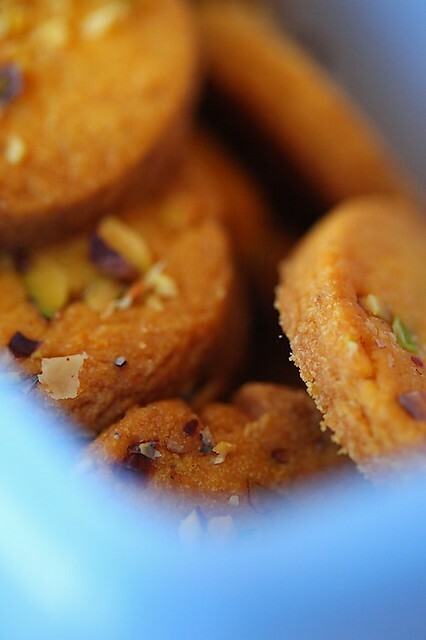 Coming back to these cookies, I packed boxes of cake, cookies and laddus to give to friends and family this Janmashtami and these cookies were a part of these gifts. These cookies were not just great to make but also won rave reviews from many who tasted it. Make them and store them in an air tight container to munch away when you feel like or to serve to special guests or to pack them into little gifts to give away! With all the exotic spices and the crunchiness and the melt in the mouth texture, these are sure to win many hearts! Try replacing the plain flour with whole wheat flour if you are making it for toddlers or if you would like to do so! The only difference would be that the saffron flavour would not be as distinct! 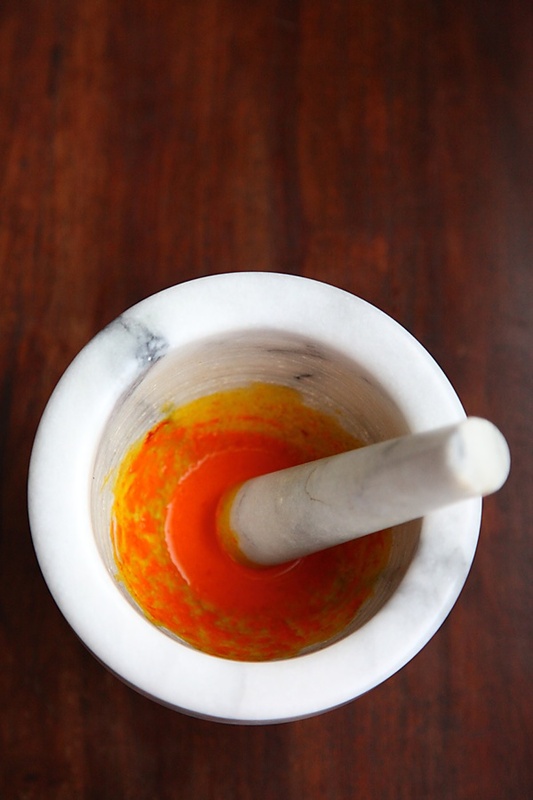 Place the saffron with the warm milk in a mortar pestle. In a mortar and pestle or coffee mill, grind the cardamom seeds and nutmeg to a fine powder and keep aside. Chop the pistachios into small pieces. A mezzaluna is great for this purpose! 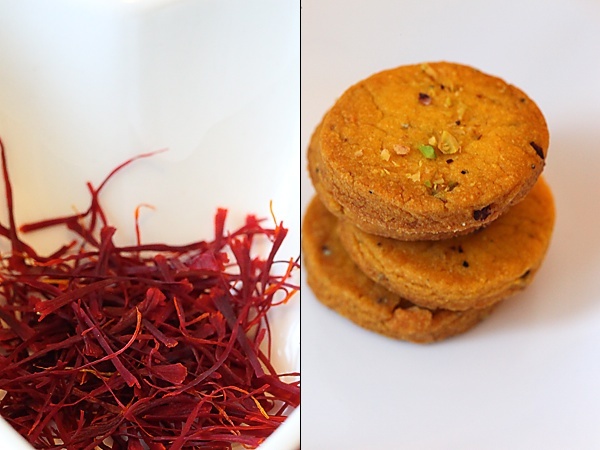 Crush the saffron into a smooth paste using the mortar and pestle. In a large bowl or in the bowl of a stand mixer, mix the ghee and the sugar together. Put in the saffron mixture, cardamom and nutmeg powder and blend well. Put in the flour and form into a dough. If the flour refuses to co operate, add a few more drops of milk, just enough for the dough to come together and form into a dough. Divide the dough into two halves and on a clean surface roll half of the dough into 6” circle. Sprinkle half of the pistachios over it and lightly roll with a rolling pin. Using a cookie cutter of your choice cut into cookies. Assemble the remaining dough, roll again and cut. Repeat until you have no dough remaining. Repeat the above step for the remaining half of the dough. Place the cookies on a tray lined with butter paper and bake for 15 minutes. Cool completely and store in an air tight container. The cookies look divine, there is no doubt you've received rave reviews with these cookies. They look rich and delicious, credits to your photography! Omg, wat a rich looking cookies,amazing.. They loook so tepting in d pictures as welll….. Thank you everybody…these cookies are really good and I wish I could have shared them with all of you! Hi, Easy recipe and good outcome. Enjoyed baking Cookies today! Vandana: Glad you enjoyed this easy and awesome recipe! Neha: You can use plain flour which means maida…and for a healthier version, whole wheat flour, atta! Recently have turned to divine cooking(coz my husband insists that we offer all our food to Lord Krishna before we have it)so these days i spend most of my time on google looking for no onion no garlic recipes, eggless cakes etc when i came across ur website…I really appreciate the novelty in ur recipes and that u respect ur good old traditional way of cooking using mortar and pestle….the pics r also superb…Keep up this gr8 work…Lord Krishna Bless u…. Suchi: That's so wonderful to hear! All the best with your baking. Chaitra: Room temperature ghee. Happy baking! PS: I doubled the proportions you have mentioned and got around 30 cookies – 2" wide and 1/4" thick. Nalini: Thanks for your feedback. Great to hear that your family enjoyed it! Have to tell you that I chanced upon your site yesterday when I was casually browsing to kill time at home as was on my sick leave, but I have been hooked onto it ever since ! you have the best collection of recipes, not to mention that it is wonderful too see how you use the simplest ingredients. I have a question, not sure if it will sound silly. How is it that we can get cookies like the above without any baking soda/powder and yet these are a constant ingredient in the more common cookie recipes? Saumya: This recipe does not involve baking powder or soda. It is like a shortbread cookie which has only butter, sugar and flour. and these are delicious, Hope you will try them out. Priya: Thanks for the feedback! I made these today,with whole wheat flour instead of maida…they came out nice,however i had problem rolling them as they would crumble at the edges and would be difficult to transfer them onto the baking tray,crumbling in the process.What could have gone wrong? However after they are baked,they tasted good ,though a bit chewy..could it be because i used atta flour?Thank u.
Ashwini: Whole wheat flour would require different ratios of liquids. Flours vary in their water and flour absorbing capacities. This recipe was tested using plain flour or maida. But whole wheat flour should work as well. Use a little more liquid than that stated in the recipe. I tried these cookies and the tasted good, but they did not keep shape like yours. I have faced this with other cookies I have tried that do not use butter. What am i doing wrong? niki: Your dough must be very stiff so you are not able to shape your cookies. There must be enough fat/moisture content to make the dough pliable enough to shape the cookies well. Different flours have different water absorbing qualities so you have to make your dough accordingly by adding a few spoons more or less of the liquid/fat in question. Thanks for the reply. My dough was not stiff, in fact, I shaped them well before I put them into the oven. They lost shape (spread) once they started baking. Can you help? Hi Anushruti. I found your recipe interesting, especially with the use of saffron, and tried it last evening. However, despite following the recipe to the T, the first batch was hard and difficult to bite into even though I baked them for only 15 minutes. Then to the remaining dough I added 1/2 tsp of baking soda and baking powder each and let it set. Then the cookies rose and turned crisp just as required. I just feel the recipe lacks these two components. If you feel anything else can substitute that please suggest. Thanks. Can I substitute whole nutmeg with nutmeg powder? How much should I use to substitute 1/4 nutmeg? Divya: You will have to powder the nutmeg. You can't use it whole. Powder 1/4 of a nutmeg and use it and if you have any doubts feel free to clarify. have just taken them out of the oven and they are heavenly! I substituted rice milk for milk and used half maida and half whole wheat flour. I just rolled the dough into a log and cut circles instead of rolling it out. What a gorgeous little cookie! Thanks for sharing. (Luk,texture nd taste) all loved it specially my little one. Poonam: Thank you for your wishes. Baked these now and boy are they good! Thanks made these for my daughters' 9 month bday date! Saranya. I am planning to bake a big batch of these for my daughters' birthday . How many days in advance can I bake these! Look forward to your reply . Saranya: These cookies have a large shelf life. Can stay upto a month or more when put in an air tight container. You can make them a week in advance for your party maybe. Awesome , planning to make these and pack as party favors for her first bday party! Have baked 12 different cakes and cookies recipe of yours for her monthly birthdays. Thank you so many ch! I 've made these a few times and I absolutely love them..thanks a ton for the recipe. Hiba: You made my day by saying that! Hi Anushruti. Made these cookies yesterday. Trial batch so made very few. They turned out well though not as yellow as yours. Also wanted to know what is the size the cookie should be. Mine were not soft they were crisp as made them really small. ( coin size). Is that why ? Hello! You know..I don't come here to source for recipes, I simply come here to drool! Haha…whenever I have time, though, I do get to trying recipes. I just baked these about two hours ago and MY OH MY they're wonderful. I have little patience so I just rolled the whole dough on my worktop, cut the edges o form neat, square dough, sprinkled the pistachios and very little amount of sea salt and proceeded to cut them into squares. OH BOY. So delicious!!! packing them as gifts for my best friend and my mom had fun dunking them in her tea! I will try them with almonds, walnut etc next. THANK YOU SO MUCH. God bless you! Ellkayseven- Thanks so much for your feedback! Made my day! Three years ago I had baked these cookies for my friend. We later went on to fall in love and marry each other. This recipe always reminds me of the start of my beautiful relationship. He still jokes that I made my way into his heart through these amazing cookies. Thank you for unknowingly bringing me one of the greatest joys of my life. God bless! Gayatri-I'm so happy to hear about your story! Its very heartening and inspiring to know that this recipe played such an important role in your life. Thanks for writing to me. chanda- Thanks! Scroll down below the recipe and you will find the "print" button. Pooja- Are you baking in the centre rack? And is your oven working fine? Vini Mehta- You are welcome. Thanks for the feedback. Deepa: Yes, they could be crisp due to the size. I baked them and the flavor was wonderful. All your recipes are foolproof Anushruti!Thank you again. I had a question though : what is the ideal texture of these cookies? Soft or hard? want to make sure that it is not because I over mixed the dough!Thanks in advance. Aditi: Glad you liked the recipe. These cookies are nice and crisp. Amazing recipe.. i shall try them soon..
the only query i have is.. can i replace pistachios with almond or Cashews? Hi i tried making these cookies as per the instructions but it took me lot longer than 15 mins.Mine took more than 30 mins on 180 degree temperature.I don't know where i went wrong.I loved the taste though.Thanks for the lovely recipe. sarah: Every oven is different so yours, no idea why your cookies took so much time to bake. Glad you liked them though.